A.K: You are one of the girls to watch when it comes to kitesurfing. It’s inspiring to see what you do on the surfboard. Why do you think there is so few girls taking up wave riding? A.E: I think it’s probably because of the boom of the freestyle style. I Think strapless riding is something that comes after spending sometime with the twintip. It’s not like you gonna pick up a twintip just for few sessions and then pick up a strapless board all of the sudden. I’s probably not gonna work too well this way. It is possible of course, but normally those who want to ride surfboards have to spend some time on a twintip first. The other reason is that the ‘kitesurfing industry’ is showing mostly freestyle and cool chicks in the bikinis and boots in all the kitesurfing magazines and kiting videos. A.K: You were boosting quite impressive freestyle jumps before hopping on the directional board. What made you change the style? A.E: I was actually pushed to strapless, because I had few injuries in straps and boots as well. I sort of had to take the surfboard because I couldn’t ride boots right after a foot injury and I couldn’t unhook because I had broken my arm. I had to take it easy without risking getting myself injured again, so I took the strapless board. At the time I took an ordinary surfboard and I started learning this. I was riding after about 5 months of not being in the water so I really enjoyed it a lot. I started improving little by little and bit by bit. You finally feel like you can do stuff, you can jibe, you can do different kinds of transitions and eventually catch some waves and you realize how awesome is the feeling of riding the waves. A.K: It is interesting because although you have started riding strapless because of the injuries, you actually decided to stick to it and now you have recovered from the injuries but we see you on a surfboard anyway. A.E: It’s because for me strapless riding feels almost like a different sport. After spending about 8 years on a twintip, picking up a directional board is like picking up a new hobby, it feels really refreshing and there is so much to learn. I’m not saying that surfboard is harder than twintip, it’s just very different. The feeling of riding the waves it’s just amazing. When I ride the twintip these days I still like to jump, I haven’t retired from freestyle completely, but my first choice would be wave riding. A.K: What’s your favourite set up? A.E: Definitely it is my 9m Crazy Fly Sculp and I just got the new board-Crazy Fly Strike 5’4” with the cut-off tip. The board is designed for strapless freestyle, so I’m now starting to learn this new style. A.K: Now you got new CrazyFly Strike board. What are the differences you notice when riding it in comparison to your old surfboard? A.E: It feels more maneuverable. When you doing things like the duck tack, kicking the board upwind, you really feel like the board reacts in a lighter way. A.K: The board looks different than the traditional wave riding board with the surfboard shape. Did you have any difficulties getting started with it? A.E: Yes, I was standing too much in front of the board, the nose that has more squary shape, is more likely to accidentally get ‘stuck’ in the wave if you distribute your body weight in the wrong way. It took me couple of sessions to get used to it and I did fall to the front few times because of the different shape. This board is made more for the smaller waves and medium-size waves. The fins are a bit smaller, which helps maneuverability, but it grips slightly less when you’re on the wave. Saying that I just started with this board, so I’m excited to see what it can do? A.K: Do you prefer the Crazy Fly 2016 Strike to the 2015 Crazy Fly Straples board you were riding before? A.E: At the moment it’s new for me so yes I prefer it because it will push me to do more freestyle tricks. A.K: You have been riding in Tarifa for many years, which is an epic spot, where would you like to practice your strapless freestyle? A.E: Tarifa is my favourite spot. It is very challenging spot because everyday is different, different kind of wind, different kind of waves, so I love it here. My favourite spot around here is Tangana, Valdevaqueros. 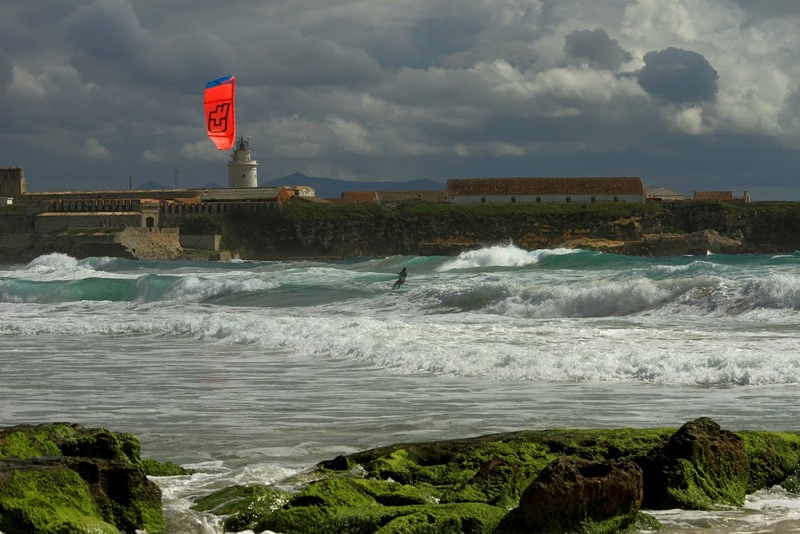 I would like to explore Canos de Meca more, because the wave there are great. Apart from my local spots I would like to go to Dakhla, because I can ride both there. There are waves, there is flat water also, so I could take both of my boards and practice freestyle with the twintip and freestyle with the directional board. A.K: How are you finding your new kites? Are they much different from the last year models? A.E: I absolutely love them. I can’t tell how different they are because last year I rode Crazy Fly Tango and this year I have Sculp. Tango was great because it has different set-ups for the wave riding, freestyle and wake, so it was perfect choice for me because I wanted to do freestyle, but then I got injured. I prefer to have Sculp because it feels more boosty and powerful. Although Tango is a wave kite it depends on the personal preference and since I like a bit more bar pressure and power Scalp suits me great. It’s a very fast and easy looping kite, which is what I like in a kite. A.K: Which kite would you recommend for someone who wants to start kitesurfing with a surfboard? A.E: Both Sculp and Tango are great. It’s a personal preference and it takes some time and experimenting to find a setup that suits best. In terms of a board it’s always a good idea to start from slightly bigger board. Even a non-kitespecific surfboard of about 6 feet will do if you want to keep the cost low. It’s going to be a bit easier to do your first jibes on a bigger board. A.K: Thank you Anna, it was great to speak to you and I’m looking forward to seeing you freestyling on the waves with the new Crazy Fly board. A.E: Thank you. I will keep you posted about the progress. This entry was posted in News and tagged Anna EnochovaTarifa, Crazy Fly, Crazy Fly board, Crazy Fly Sc, Crazy Fly Strike, Crazy Fly Tango, CrazyFly, CrazyFly Strike, kitesurfing magazines, kitesurfing video, surf, surfboard, twintip, wave.